L'exposé qui suit, en langue anglaise, a pour objet les débuts de l’organisation qui deviendra la Grande Loge Unie d’Angleterre. Certains lecteurs le trouveront trop critique et peut être injustement sévère à l’égard de la Mère de toutes les Loges du Globe ; d’autres n’adhéreront pas aux hypothèses et aux conclusions que propose l’auteur. Son rédacteur a pour intention première de porter un éclairage sur la naissance de cette Grande Loge et le lecteur est invité à relever que les détails précis n’abondent pas quant aux motivations réelles des protagonistes du projet. Sa motivation est seulement placée dans le désir de mieux pénétrer et comprendre les fondements historiques de l’Ordre ; il est d’ailleurs persuadé de partager ce sentiment avec bon nombre de Maçons qui se sont interrogés, comme lui, sur les sources du mouvement maçonnique et en particulier sur celles de l’UGLE. Il avoue également, en tant que Jacobite de cœur, tenir à mettre en exergue le rôle tenu par la Franc-Maçonnerie Jacobite dans la période formatrice de ce qui allait devenir une Franc Maçonnerie nouvelle. Enfin il reconnaît l’incroyable destinée qu’a eu ce projet de Grande Loge de Londres que ses concepteurs n’avaient certainement pas anticipée : une organisation de dimension mondiale unissant des hommes mais aussi des femmes de tous horizons qui partagent un idéal de Fraternité et cultivent au quotidien l’humanisme. Un succès indéniable que trois siècles d’existence attestent avec Force et Vigueur. Nouméa, le 23 mai 2016. I have never really been satisfied by the accounts relating to the founding of the Grand Lodge of England that I have been given to read. Whose idea was it ? What exactly was the objective ? Why at the given precise moment in the Craft’s history ? How come the membership increased so rapidly ? Why appoint at its head gentlemen belonging to the nobility with absolutely no masonic knowledge or background whatsoever ? Versions sometimes diverge on these matters as well as on the parts played by the different actors involved in the process of conception and birth of the modern form of our Craft. Put in modern medical terms, I feel allowed to state that if the delivery seems to have been painless, it was most certainly induced. Recently I have heard some surprising and rather astounding statements in open lodge referring to the behaviour of Reverend James Anderson (identified as having been a forger of genealogical trees) and to the contents of the Constitutions he compiled (contents that don’t out rightly state that our Craft is of Scottish origins for instance). Was also questioned the part Desaguliers could played, as a Frenchman, in the English Grand Lodge. I well understand that for a newcomer the issue is far from being crystal clear, not to say utterly confusing. As for myself, I must confess there remain some greyish patches in the story that is generally presented to us. What the statements made on this occasion in open lodge reveal is that one needs to dig deeper down when researching, confront different sources of information, go to the original documents when possible. Seeking the advice of one’s elders can also be of good use. I’m afraid it may as well indicate that we are not delivering and circulating sufficient knowledge amongst our younger brethren. It’s to attempt to clarify this founding part of our History that I set off to write this paper. I don’t believe I shall come up with all the correct and fully satisfying answers, not being the first one to tackle the subject, and far from being able to exhibit the qualities of many of my predecessors. These are not sufficient reasons to prevent me from undertaking the projected task. Examine the book of Constitutions : look into its different parts, highlight what seemed relevant in each chapters of the given part by commenting upon its content, especially if the topic is to be developed further down in the proposed work. Succinctly look into the biographies of the main actors to extract what pertains specifically to their masonic activities. « Was Anderson right ? Who was he ? » by RW Ossian Herbert LANG (1865-1945), Grand Historian (USA), a paper which he wrote in 1932. « Anderson’s Constitutions of 1723 » written in 1932 by Brother Lionel VIBERT, Past Master of Coronati Lodge N° 2076, England. 4. Put forwards a political explanation to answer some of the questions for which we are seeking answers. This last chapter that I have entitled “ On His Majesty’s Service ? ” is the expression of a strictly personal view that I would like to submit to your perusal. Cover of the book of Constitutions (American version printed in 1734). It reproduced verbatim the contents of the English 1723 version and was printed at the initiative of Brother Benjamin Franklin. The book starts by a dedication (from page 3 to 6) to his Grace the Duke of Montagu signed by Deputy Master J. T. Desaguliers. It mentions the document being approv’d by the Grand Lodge when your grace was Master (i.e. 1721-1722). We are told of the pains the learned author took in compiling and digesting the book from the old Records and further how he rendered the New Constitutions a just and exact account of Masonry from the beginning of the World to his Grace’s Mastership, serving all that was truly ancient and authentic in the old ones. The learned author is of course James Anderson. The second part is the longest one entirely devoted to the History of Freemasonry and goes from page 7 to page 45. James Anderson was commissioned to write this history of the Craft by the Grand Lodge of London and Westminster in September of 1721. The story begins with Adam our first parent, involving afterwards Noah and his three sons and other biblical personages. We then travel to Chaldea, to Egypt where we meet Moses that we follow on his way to the Promised Land. There appear many outstanding historical characters such as king Solomon, Zerubbabel, Cyrus the Great, and Darius to name just a few. We past over to the land of the Britons occupied by the Romans, then to France, accompany William the Conqueror to England, go up to Scotland to encounter the Kings of that Realm to end our historical trip with the Stuart kings in the eighteenth century. I haven’t detailed this section of the book as we all have understood that it is purely a legendary history as says Lionel Vibert, and that no concrete and documented evidence sustains what we are told. Ossian Lang says that in his recital of events he (Anderson) gave rather free rein to his imagination, but adds he did no more than a host of others have done after him. Another brother quoted by Lang, named Robbins, characterized Anderson’s work as imaginative, fantastic and unhistorical (I believe the quote is referring to the historical chapter itself but also to Anderson’s narration of the events between 1717 and 1723). This being said, many an element mentioned in the text shall be taken up by later authors of rituals covering what are often identified as high degrees or side degrees, and I’m thinking in particular of the Royal Arch degrees and certain degrees of the Ancient & Accepted Scottish Rite. The elements, which are incorporated, are those that home a mythical content and involve an outstanding historical (or not) character, which will serve to illustrate our peculiar system of morality within lodges and chapters. The next part relates to the Charges of a Freemason, which are covered from page 47 up to 57. We are informed that the Charges that follow have been extracted from the ancient Records of Lodges beyond Sea, and of those in England, Scotland and Ireland. Lionel Vibert declares that Anderson incorporated freely and with and entire disregard for textual accuracy any passages in the Old Charges that suited him. He further states that the worthy doctor never saw any Irish record and that we can safely dismiss his lodges in Italy or beyond Sea as equally mythical. The statement is severe. Lang doesn’t really agree with what he calls Vibert’s various strictures, which according to him originate in Dr Willielm Begemann’s monumental work on Freemasonry. In the quarrel, which opposes these learned exegetes, I find it difficult to side with one or the other. How can we know with certitude what documents Anderson had available and what he extracted from which one ? Bro Vibert in his paper declares that of the six Charges themselves the first caused trouble immediately. It replaced the old invocation of the Trinity of the Christian belief in Lodges by a vague statement that we are only to be obliged to that religion in which all men agree. Funnilly enough the content of this article allowing men of all different religious confessions to sit side by side in a Common House or a Centre of Union, in other words a Masonic Lodge, will participate largely to the success of our institution and its internationalization. I personally consider this first charge to be the keystone of our Craft conveying a message of Tolerance and Equality amongst men (I will revert to this aspect of the new Grand Lodge in the last part of the present paper). The vague statement referred to above proposes to all men of good will to get together, joining on a minimal basis by putting aside what differentiates them and taking into account something they should share: the belief in a Supreme Being. It’s undeniably a deist conception of the universe that the French philosopher, Voltaire, would most certainly subscribe to – he who said that if one could see the clockwork in which we were immersed could but accept there being a clockmaker. It is of course a brand new concept and a certain time will be necessary for it to be assimilated within the Craft. Strangely the concept won’t prevent the dawning and spreading of new degrees as from the 18th century, based on purely Christian credos such as the Holy Trinity and requiring solemn oaths to be taken confirming one’s religious beliefs (such as the Degree of Knight Rose Croix or the degree of Scottish Knight of Saint Andrew). It appears to be in direct contradiction with the contents of this first charge adopted in a document considered to be fundamental to our institution. Doesn’t it exclude brothers of non-Christian confessions from the Centre of Union? I shall not answer this question here: the matter is indeed of importance but not within the scope of the present paper. The second head of this section is Of the CIVIL MAGISTRATE supreme and subordinate. It starts by telling us that a freemason is to be a peaceable Subject to the Civil Power. He is never to be concern’d in Plots and Conspiracies against Peace and Welfare of the Nation. Being members of the Grand Lodge of New Zealand, we are aware of the content of this text, very close to what we are told when joining a blue Lodge. The third head is titled : Of LODGES. It contains nothing unknown to us once again. We are told the candidates must be good and true Men, freeborn, and of mature and discreet Age, no Bondmen, no Women, no immoral or scandalous Men, but of good report. Let’s take note of the: “no Women”. This issue is nowadays a source of disturbance and sometimes turbulences within the masonic sphere. Fourth head : Of MASTERS, WARDENS, Fellows, and Apprentices. I noted that an apprentice should, amongst other things, be a perfect Youth, having no Maim or Defect in his Body. This of course reminds us of the days prior to speculative masonry. I also noticed that to be appointed Wardens in a Lodge, one had to be a Fellow Craft, which reminds us that the Master degree didn’t exist in the period we’re looking at. Let’s now look at the fifth head Of the Management of the Craft in working. In fact, it looks into the way a lodge should be managed and directed, more as a professional organisation, an operative lodge rather than a Lodge such as we are used to. I remarked that Craftsmen are to avoid all ill Language, and to call each other by no disobliging Name, which may suggest that our brothers of yesteryears were less urbane than us. The sixth and last head bears the title: Of BEHAVIOUR. Us seen above in the general presentation of the Charges, this part is divided into six under-sections dealing with all situations in which a brother can be involved. There are some recommendations such as to avoid all Excess, or forcing any Brother to eat or drink beyond his inclination. Further we are told that no private Piques or Quarrels must be brought within the Door of the Lodge, far less any Quarrels about Religion, or Nations, or State Policy, we being only, as Masons, of the Katholik Religion… We find the wise and appropriate banning of divisive subjects such as religion and politics from lodge meeting, which allows the Centre of Union to be peaceful and harmonious. Surprising may seem the statement that all masons are of the catholic religion, especially in an Anglican kingdom and in a document compiled by a protestant priest. So why is the word “katholic” chosen here to qualify the brethren? Because it can also bear the meaning “including all Christians” or more precisely “universal” from the Greek origin of the word: Katholikos, meaning universal (kata meaning in respect of and holos meaning whole). A few lines further we are informed that this Charge has been always strictly enjoin’d and observ’d; but especially ever since the Reformation in BRITAIN, or the Dissent and Secession of the Nations from the Communion of ROME. Within this last section, prudence is recommended to masons who must in all cases and situations be cautious and always cultivate brotherly love. We all have received similar recommendations. This part of the Book of Constitution ends by a Postscript pertaining to the Opinion of the Great Judge Cook communicated to the Author (while the Sheet was printing). It is not relevant for the purpose of this paper. The next section of the Book of Constitutions bears the title: GENERAL REGULATIONS. They extend from page 59 to 77. George Payne compiled the Regulations in 1720 when he was Grand Master; they were approved on Saint John Baptist Day in 1721 (24th of June) by Grand Lodge. John Duke of Montagu was chosen as Grand Master for the ensuing masonic year on the same day. Bro Lionel Vibert in his above mentioned paper states that the version we have in hand is a revised and expanded version by Anderson ; he of course deplores that we do not possess the original text. No Lodge shall make more than FIVE new brethren at one Time, nor any Man under the age of Twenty-five, who must be also his own Master; unless by a Dispensation from the Grand Master or his Deputy. Again this refers to an operative mason, but still retains its topicality when it comes to the age of a candidate and the number of candidates to be received at one Time. No man can be entered brother or admitted to be a member of a lodge, without the unanimous consent of all the Members of that Lodge. I believe this rule is no longer applicable throughout modern Freemasonry. By personal experience, I regret it. Including in the Regulations is a Postscript describing the Manner of constituting a NEW LODGE, as practis’d by his Grace the Duke of Wharton, the present Right Worshipful GRAND MASTER, according to the ancient Usages of Masons. It goes from page 75 to 77. It is followed on page 78 to 80 by the Approbation signed by Philip Duke of Wharton, Grand Master, and J.T. Desaguliers his Deputy. It is explained that the old constitutions were of poor quality: mangled, miserably corrupted and containing false Spelling and false Facts. This justifies the need for new ones. Then we are told how the new ones were compiled, being examined, corrected and finally approved. Significant of the objectives and will of the new Grand Lodge is the final declaration stating that these constitutions be received as the ONLY Constitutions of Free and Accepted Masons amongst us. The Approbation ends on page 80 with a list of 20 Masters and Wardens of particular lodges. The last large section is devoted to SONGS or the History of Masonry that cover pages 81 up to 91. It appears obvious by the number of existing songs that our “ancestors” liked to sing and on many an occasion. Are listed: Master’s Songs, Warden’s Songs, Fellow-Craft Songs, Entered Apprentice’s Songs, and to end A New Song. On the final page numbered 92 is a statement made in London on the 17th day of January 1722,3 at the Quarterly Communication: at the command of Philip Duke of Wharton, Grand Master, the book is presented and recommended for the Use of the Lodges. (*) Note: 1722,3 is in 1722 according to the official reckoning dating or 1723 according to the so-called new style calendar. The calendar system applicable in England was definitively reformed in 1752. It’s now time to examine the biographies of the men who appear in the creation and the first years of the Grand Lodge of England. Some took an active and decisive part in the project, others not. We have to start by James ANDERSON whose name has remained linked forever to the 1723 Book of Constitutions. James Anderson was born in 1679/1680 in Aberdeen, in Scotland. He was educated in his birthplace and ordained a minister in the Church of Scotland in 1707. He then moved to London where he ministered in different locations until his death in 1739. Bro. Lang says his literary output was staggering, considering the amount of research involved. He wrote many sermons some of which were published, such as the one entitled “No King-Killers” delivered on the anniversary of the execution of Charles I. His main work remains the “Royal genealogies or the genealogical tables of emperors, kings and princes from Adam to these times”. He also wrote “A genealogical history of the house of Yvery, in its different branches of Yvery, Lovel, Perceval, and Gournay” commissioned by the Earl of Egmont and his son. He also wrote a theological treatise: “Unity in Trinity and Trinity in Unity”. He is reported to have lost a large sum of money in the South Sea Company crash of 1720, fact that allows O. Lang to declare that suffering from financial losses he sought to supply his wants by compilations for which there might be a profitable market. This may explain, and if necessary justify, him obtaining the task of compiling the Book of Constitutions. L. Vibert states that the true state of the case appears to be that Anderson undertook to write the work as a private venture of his own and that this was sanctioned, since it was desirable that the Regulations at least be published; he adds further that it was discovered too late that he had taken what were felt by many to be unwarrantable liberties not only with the traditional Charges but also with Payne’s Regulations. Concerning the historical part, he mentions that in the process he twisted a text or two or supplied suitable events to fill gaps in his narrative. Despite this position he recognizes in the conclusion of his paper that the Constitutions of 1723 remains one of our most important text. According to the sources I’ve had access to, we have no date at which Anderson was initiated, but it may have been in Aberdeen. He was a Master of a Lodge in 1722 that remains to date to be identified. It seems he appeared in Grand Loge for the first time in September 1721 (we have no records of him having anything to do with Grand Loge prior to that date). What should we conclude ? That very little information is available pertaining to Anderson’s masonic activities apart from his involvement in the compilation of the Constitutions. It appears to me that he wasn’t to fussy and rigorous when it came to dealing with historical facts and analysing ancient documents. I have to admit the task must have been far from obvious given the numbers of documents written in more than one dialect and at different periods of the existence of the Craft, not to mention versions that, I suppose, sometimes must have diverged. The author of the Constitutions was close to being a professional writer, with formal education and background. He needed the money at the time (I read that he had a dispute when further edition were published concerning his author rights). I feel like saying he was most probably the best person available in the right place at the right time. The next person we are to evoke is Anthony SAYER. We know very little of him: born in 1672 he deceased at the age of the age of seventy in 1742. On 24th June 1717, at the Feast of St John the Baptist he was elected the first Grand Master of the Premier Grand Lodge of England. Captain Joseph Elliot was his Senior Warden and Jacob Lamball, master joiner, was his Junior Warden. He further served as Grand Warden under John Theophilus Desaguliers in 1719. We also know that he had financial difficulties, probably another victim of the South Sea Bubble, and that he petitioned Grand Lodge for charity in 1724, 1730 and 1741. He also twice received assistance from the Old Kings Arms lodge. He is qualified as “Anthony Sayer, Gentlemen”. He retained a great deal of respect amongst his brothers and many brethren attended his funeral according to the report of a London newspaper. Next on our list is George PAYNE who was born circa 1685 and deceased in 1757. He became in 1718 the second Grand Master of the new Grand Lodge. He was re-elected in 1720, year in which he compiled the General Regulations. He was appointed Grand Warden in 1724, Deputy Grand Master in 1725 when the Duke of Richmond was occupying the Grand Master’s chair. At the meeting on 24th June 1718 he is said to have asked brethren to collect all documents and written archives pertaining to the Craft that they could get their hands on and to leave them with Grand Lodge. The objective was obviously to make available all possible material for the compilation of new General Regulations. At the meeting of 24th June 1721 the General Regulations that he had compiled in 1720 were approved by Grand Lodge. It is reported that at the meeting he produced an old manuscript of the Constitutions, some 150 years old, that he had obtained in west England; it is thought that it must have been what is known as the “Cooke Manuscript”. He was appointed Secretary to the Tax Office on 20th July 1732, and Head Secretary on 8th April 1743. He sat on the Committee of the Grand Lodge in charge of amending the Constitutions in 1756. He also attended a last Grand Lodge meeting in November 1756, at the age of 72 and approximately two months prior to his death. Lang says of him that he was an antiquarian and a man of great substance and that he brought order into the organization. The next person we are to examine the biography of is John Theophilus DESAGULIERS who was born on 12th March 1683 at La Rochelle on the southwest coast of France. His father, a protestant Minister, was exiled as a Huguenot by the French catholic regime. He was ordained as an Anglican by Bishop Henry Compton of London, and sent to Guernsey. Jean Théophile, as he was then known, was baptised as a Protestant in La Rochelle and with his mother had to flee to Guernsey (Louis XIV had revoked the Edict of Nantes 1685 which tolerated the Reformed Religion). In 1694 the family moved to London, and Jean (now using his anglicised name, John), after attending grammar school entered Christchurch, Oxford. He obtained a Master degree in Hertford College, Oxford in 1712. He was afterwards granted an honorary degree of doctor in Civil Law in 1719. He was ordained a deacon in 1710, at Fulham Palace, and as a priest in 1717, at Ely Palace in London. He became a lecturer and promoter of Newtonian Philosophy, advertising courses of public lectures in 1712. He even lectured in French to king George and his family at Hampton Court (the German Hanoverian king was more fluent in French than English). In 1714, Isaac Newton, president of the Royal Society, invited him to replace Francis Hauksbee as demonstrator at the Society’s weekly meetings. Soon after he was made a Fellow of the Royal Society. He contributed to over 60 articles to the Philosophical Society. He received its prestigious Copley Medal in 1734, 1736 and 1741. His dissertation concerning electricity in 1742, in which he coined the terms conductor and insulator, was awarded a gold medal by the Bordeaux Academy of Sciences in France. James Brydges, 2nd Duke of Chandos appointed him as his chaplain in 1716. He also acted as technical advisor to an enterprise in which Chandos had invested. Desaguliers applied his knowledge to practical applications: steam engines and hydraulic engineering, but also his expertise in ventilation. He was chosen as Parliamentary advisor to the board in charge of the building of the first Westminster Bridge. I read that he helped Anderson draw up certain parts of the book of Constitutions and was active in the establishment of masonic charity.He was appointed Grand Master in 1719, becoming the third one of the new Grand Lodge of England. He was chosen as Deputy Grand Master in 1722 and again in 1725. He regularly suffered from gout in winter and deceased in Covent Garden, London, after several months of severe illness on February 29th 1744. The press announcements of his death all referred to him as a gentleman universally known and esteemed. He left his wife, née Joanna Pudsey, four sons and three daughters. The Frenchman from La Rochelle had a well-filled life. It can’t be denied that he was one “the founding stones of the edifice” that was to become the mother lodge of all regular Lodges. Another person we must talk about is John Montagu, 2nd Duke of Montagu. He was born in 1690 and died on 5th July 1749. In 1717 he was admitted a Fellow of the Royal college of Physicians. He was made a Knight of the Garter in 1719. He became a member of the Order of the Bath and a Fellow of the royal Society in 1725. George I appointed him governor of the islands of Saint Lucia and Saint Vincent in the West Indies. In 1745 he raised a cavalry regiment known as “Montagu’s Carabineers” which was disbanded after the battle of Culloden in Scotland that put an end to the 1745 rising leaded by Bonnie Prince Charles Stuart. He was a notorious practical joker. He is said to have once dunked the French political philosopher, Charles Louis de Secondat de Montesquieu, in a tub of cold water as a joke. As one can guess his “jokes” were not always appreciated. He appears on my list having been the fourth Grand Master, appointed in 1722, of the Grand Lodge. Of his masonic career little is known. One can believe that he “landed” in Grand Lodge as a member of the nobility chosen to occupy a more or less honorary position and attract gentlemen of his kind. Philip Wharton, 1st Duke of Wharton, who succeeded the Duke of Montagu, was the second member of the nobility to sit in the chair of Grand Master. He was appointed in 1722. Born on December 21st 1698, he joined the Grand Lodge above on May 31st 1731. He had a short life, but an eventful and turbulent one, as we shall see below. He was reputed as an eloquent speaker and was for some time a powerful Jacobite politician. Ossian Lang describes him as a dissipated, unstable, ambitious, turbulent young man. When travelling on the Continent in 1716 he turned Jacobite after meeting James Francis Edward Stuart, the “Old Pretender” and son of James II, who created him “Jacobite Duke of Northumberland”. In Ireland, where he went afterwards, he entered the Irish House of Lords as Marquees Catherlough. The Hanoverian George I created him, the Jacobite partisan, Duke of Wharton in 1718. It was most certainly a political act on the behalf of the king: an effort to solidify his position and to divert the young gentleman from the Jacobite movement. In England he was an active member in the House of Lords in opposition to Robert Walpole. He backed the “Old Pretender” because he was on “Old Whig” whose principles had been betrayed by Walpole and the new non-native royals (i.e. the Germans of the Hanoverian dynasty). He even went to publishing “The True Briton” to oppose the rise of Walpole. Even before his considerable financial losses in the South Seas Bubble stock market crash, he had accumulated debts. It’s worth mentioning, to have a better picture of the sort of person he was, that he hired musicians and a hearse and held a public funeral for the company! He had sold his Irish assets and invested in the Company rather than wiping of the slate existing debts. His debts were in fact impossible for him to overcome. His dissipated lifestyle offended more than one person: drunkenness, inappropriate actions when in public and so on. He went to Rome and the Old Pretender on this occasion gave him the Order of the Garter. He moved to Madrid in Spain where his behaviour grew even more offensive. The Jacobites themselves considered him to be a dangerous person to be near to, and many thought he was a liability to their movement. In 1728 he wrote a powerful piece against the “corruption” of Whig causes under Walpole entitled “Reasons for leaving his native country”. At this stage he sold back his Duke title to king George I and took up a position as lieutenant colonel in the Jacobite forces incorporated in the Spanish army at war with England. This warranted a charge of treason in 1729. He offered to pass over intelligence to English spies. His offer was declined, the said spies rejecting the character as of little value. He returned to Madrid where for inflicting a severe caning to his valet for which he was imprisoned and after banished. In 1730 he renounced James and the Jacobite cause. He finally moved to the Royal Cistercian abbey of Poblet in Catalonia, in the north of Spain, where he died. How was this character chosen to head the Craft? I have no idea. Were being a Duke and member of the nobility a sufficient reason ? Added to the fact that in August 1721, when admitted in the Society of Freemasons (as reported in Applebee’s Original Weekly Journal), he was just over 22, it is frankly incomprehensible. His election as Grand Master was troublesome, as correct masonic procedures weren’t followed. It appears the candidate was in haste to occupy the Chair. With his other activities and diverse “schemes”, it is difficult to believe he got honestly involved in Freemasonry at all. Let’s conclude by saying the young Duke was “parachuted” in Freemasonry where he shouldn’t have ever “landed” and probably also turned out to be a real liability to our Craft. Politically he swayed back and forth between Jacobites and Hanoverians positions (I even was able to note that he embraced the Orange cause). It is said (truth or legend ?) that his apron and gloves were solemnly burnt in Lodge. The last person I would like to evoke was only indirectly involved in the events surrounding the birth of the Grand Lodge of England. It is Sir Christopher WREN, born in 1632 and deceased in 1723. He is best known as the designer of over fifty churches in London, including St Paul’s Cathedral, that had to be rebuilt after the Great Fire in 1666 in which about two thirds of the capital were damaged or destroyed by the flames. He was adopted a Brother, on May 18th 1691, at a great convention, at St Paul’s Church, of the Fraternity of Free-Masons, as would appear from a manuscript notation made by John Aubrey according to Lang. On the part he played in the Craft, opinions diverge: was he a sort of honorary member or patron, or a grand Officer as claimed by Anderson? Some sources indicate that he was appointed Grand Warden at the General Assembly of December 12th 1663 and that he was Deputy Master until 1685, Grand Master in 1685 also, and then Grand Master from 1689 till 1716. Most of these dates are anterior to the date indicated of his initiation. Has confusion been made with the Worshipful Company of Masons of the City of London? It’s possible. Our Bro. Martin I McGregor of the Research Lodge of Southland N°415 wrote an exhaustive paper in 2005 entitled:” The Life and Time of Sir Christopher Wren”. In his very interesting work, he says that Anderson was an amateur and inexperienced historian, but does add further, although he was a competent genealogist. He believes, which seems effectively more probable, that he should have been designated as a Patron, Superintendent or Master of Work prior to his becoming a freemason. Were there Grand Officers before 1717 ? I choose to examine his biography because Anderson talks of the drooping Lodges of London that are neglected by Sir Christophe Wren. This statement seems to have been accepted ever since as the main reason why some brothers decided to launch “Operation Grand Lodge”. Anderson is not being very kind towards his Brother Wren. May I mention that Christopher Wren was aged 85 in 1717, which is quite an advanced age to reach in the 18th century. I find it difficult to subscribe totally to Anderson’s version of the events. Note : Before ending this part, I though it would be interesting to give some basic information on the company mentioned several times above as the South Sea Bubble. The South Sea Company was formed in 1711 and the House of Lords passed a bill, which allowed it a monopoly in trade in South America. “Dodgy” schemes resulted in the “bubble” bursting in London: an enormous stock crash and financial scandal that followed unwise speculation. The company directors were arrested, politicians were smeared and several suicides occurred. 3 – The Sequence of Events, Year by Year. In this shorter chapter, the idea is to sum up the occurrences year by year in order to obtain the clearest possible picture of the unfolding events. It’s possible that in the previous year brethren met and exchanged their concerns as to the future of the Craft. But I have to start by 1717 for which tangible or palpable information exists. It must be remembered that King George I, the new Hanoverian monarch, entered London on September 20th of 1714. The next year began the Rebellion or first Jacobite Rising that was short-lived. James Anderson in the 1738/39 reprinting of the Constitutions gives an account of the formation of the Grand Lodge of England. We are told that after the Rebellion was over in A.D. 1716, the few Lodges at London finding themselves neglected by Sir Christopher Wren, thought to cement under a Grand Master as the Centre of Union and Harmony. On St John Baptist Day of 1717 the brethren assembled at the Goose and Gridiron Ale-house and elected Mr Anthony SAYER as Grand Master. Jacob LAMBALL (a carpenter and friend of Anderson) and Joseph ELIOT (a captain) were chosen as Grand Warden. An assembly was held on St John Baptist Day. Brother George PAYNE is invested and installed as Grand Master. Anderson informs us that Bro. Payne desired any Brethren to bring to the Grand Lodge any old Writings and Records concerning Masons and Masonry in order to shew the Usages of antient Times. This indicates the intention of the new Grand Master to compile what will be known as his General Regulations. At the assembly and feast of June 24th, Bro. John T. DESAGULIERS was proclaimed Grand Master. Thomas PAYNE (gentleman) and Thomas MORRICE (stonecutter) were appointed Grand Wardens. We are told that now several old Brothers, that had neglected the Craft, visited the Lodge; Some Noblemen were also made Brothers, and more new Lodges were constituted. It is unfortunate that Anderson doesn’t quantify and identify the “new noblemen” and “the new lodges constituted. At the annual meeting on St John the Baptist, George PAYNE was acclaimed Grand Master (for the second time). Thomas HOBBY and Richard WARE were chosen as Grand Wardens. It is reported that at some private Lodges several very valuable Manuscripts concerning the Fraternity, Their Lodges, Regulations, Charges, Secrets, and Usages were too hastily burnt by some scrupulous Brothers; that those Papers might not fall into strange hands. I don’t know what “private lodges” exactly mean. Does it refer to lodges that did not wish to join the Grand Lodge? Should we deduce that they were reluctant to passing over the documents to Grand Lodge ? Maybe brethren detained personal archives and preferred to destroy them rather than transmitting them to unknown brothers ? It was decided in the future that as soon as the Grand Master was installed he would have the sole power of appointing both his Grand Wardens as well as a Deputy Grand Master. I noticed that was mentioned: George Payne, Esquire, again Grand Master. So a Noble Brother is not yet available. So did Payne accept to take over the position for a second time because no nobleman was ready to do so ? It seems to clearly indicate that the intention is to have the Craft headed in the future by member of the Nobility. If so, the reason why is not given. At the meeting on March 25th, George Payne proposed for his successor John Duke of Montagu who was later saluted as Grand Master Elect. All express’d great Joy at the happy Prospect of being again patronized by noble Grand Masters, as in the prosperous Times of Freemasonry. Here again one can wonder what exactly this means. Is Anderson referring to Sir Christopher Wren’s period ? Or to the “mythical” masters of the Craft named in his History ? Again were there Grand Masters prior to 1717 ? We are informed that sometime before this day the Duke of Montagu must have become a member of the fraternity and was made Master of a Lodge. The ardent wish of the Grand Lodge was now about to be realized. So the Duke was made a mason and master of a lodge three months before heading the Craft as “ardently” wished by the founding members of Grand Lodge. The Grand Master is empowered to appoint a Deputy Grand Master for he may not always be free to attend meetings. This remark makes the position look like more or less an honorary one. Reverend William STUCKELEY, a fellow of the Royal Society, was received in Masonry on June 6th at the same time as a Mr COLLIN and Captain ROWE. He comments that he was the first person made a freemason in London for many years. We had great difficulty to find members enough to perform the ceremony. This seems to be contradicting the statement made by Anderson in 1719 as to membership increasing and new lodges being open. There may not have been as many brothers involved in “Operation Grand Lodge” as we could be inclined to believe. At the Assembly on June 24th the DUKE of MONTAGU was proclaimed Grand Master. He named John BEAL M.D. as Deputy Grand Master, and Josiah VILLNEAU and Thomas MORRICE as his Grand Wardens. Some new brothers were made on the occasion, such as Philip Lord STANHOPE. It as this meeting that Payne produced an old manuscript of the Constitutions, which he obtained in West England. It’s also at this meeting that the Grand Master and the Lodge finding Fault with all the Copies of the old Gothic Constitutions, order’d Brother JAMES ANDERSON, to digest the same in a new and better Method. The Grand Master, at the Desire of the Lodge, appointed 14 learned Brothers to examine Brother ANDERSON’S Manuscript, and to make Report. A question should be asked here: What happened to all the old documents gathered after having been used to produce the new book of Constitutions ? Some say they were destroyed. What a pity, if it’s true. This was the first meeting and communication to which Anderson attended. On March 25th, the Committee of 14 reported that they had perused Brother ANDERSON’S Manuscript and that after some Amendments, had approv’d of it : Upon which the Lodge desir’d the Grand Master to order it to be printed. On June 24th, the lately made mason, Philip Duke of Wharton, being ambitious of the Chair, organized a meeting at Stationers-Hall. No Grand Officers were present, Wharton wasn’t Master of a Lodge and the usual opening and closings ceremonials were not carried out. He obtained his nomination as Grand Master; Joshua TIMSON (blacksmith) and William HAWKINS (mason) became his Grand Wardens. The nomination of a Deputy Grand Master was omitted. All this was of course completely irregular. The admission of the Duke of Wharton into Masonry was bound to rouse the suspicions of the Government, as he carried his Jacobite preferences to the hustings (this last word meaning: campaigning associated with an election). In the wake of this turbulence Brother Reverend Stukeley met several gentlemen with whom he reached an agreement. The government gave their assurance that there would be no Molestation as long as Wharton and his friends stuck to the Landmarks and left politics at the Lodge door. The problem having been ironed out, at the annual assembly on June 27th, his Grace the DUKE OF WHARTON was proclaimed Grand Master Elect. Things having been sorted out on a political level, John DESAGULIERS accepted to be appointed Deputy Grand Master. One can only conclude that on this instance Wharton took off his Jacobite coat and put on the Hanoverian one, again! Grand Lodge met on 17th January. Brother Montagu having heal’d the Breach of Harmony, PHILIP DUKE OF WHARTON after promising to be true and Faithful was chosen as Grand Master. John DESAGULIERS was appointed Deputy to the Grand Master and Joshua TIMSON and JAMES ANDERSON Grand Wardens (Hawkins resigned as always out of town). Anderson’s produced the new Book of Constitutions, already in the process of being printed, which was again approved. It was put on sale on February 1st, 1723. We are told that from this point Masonry flourish’d in Harmony, Reputation, and Numbers, many Noblemen and Gentlemen of the first Rank desir’d to be admitted into the Fraternity. The Grand Master in consequence was obliged to constitute more new Lodges. On June 24th something important happened: Brother William COWPER, esquire, a member of Lodge Horn, became “Secretary of Grand Lodge”. As from that day on, Grand Lodge was in a position to constitute reliable and precise records of its activity. Note : I have attempted to relate the main events that occurred over these first years of the existence of the Grand Lodge of England. I tried to go to the essential, omitting sometimes further details, but including elements that will help me to make my point in the next and last part of this paper. It wasn’t always easy to reconcile different interpretations of what happened over theses seven years; at one stage one must choose to side with one or the other of those who wrote before you, especially when facts are diametrically and/or differently recounted. I only hope not to have made too many be mistakes. 4 – On His Majesty’s Service? In the 1723 edition of the Constitutions, James Anderson gives virtually no explanations pertaining to why and how the Grand Lodge project came about. In fact all he mentions is “the drooping Lodges of London“ that need to be revived. Nothing is said of a Grand Lodge. In the 1738 edition he retraces with quite some details the events as we have seen in the previous chapter. One must bear in mind that between the two publications some fifteen years had elapsed and some masonic historians have doubts on the veracity of Anderson’s version of the events that took place. 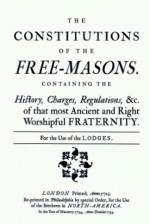 “The Old Constitutions belonging to the Ancient and Honourable Society of Free and Accepted Masons”, printed and sold in London at six pence for 30 pages by J. Roberts, based in Warwick Lane. What surprised me was that the book was published and put on the market in 1722. It contained several chapters including a History of Free Masons, Regulations in 26 articles, a Charge belongeth to Apprentices and finally Additional Orders and Constitutions made and agreed upon at a General Assembly (held at ?) on the Eight Day of December 1663. This strongly tends to prove that somebody found it worthwhile publishing a set of Constitutions, that there were customers to buy them and therefore money to be made by doing so. I ignore on whose initiative the publication was issued. The Preface presents the work as a Piece of Antiquity that has been put together as a Thing of too much Significance to pass our Observation, and which will effectually vindicate the Ancient Society of Free-Masons from all that has or can be said against them. Nobody claims to be the author. It’s manifestly a pro-masonic publication. What conclusions may we draw from the discovery of this document ? That there were still masons, if not in London and Westminster, who needed such a document. That they were others masons around who were also interested in the fate of the Craft. That Anderson had a competitor. That Anderson’s compilation and the resulting book was somewhat “revolutionary” compared to the contents of that of his “anonymous competitor”. Was the situation of Freemasonry in the kingdom so drastically bad as we are given to believe ? Maybe it varied from region to region, or from town to town ? Nonetheless, it confirms that Anderson and the team that “hired” him, played a pivotal part in the birth and conception of Modern Freemasonry – or that their project, having been successful, was the good one initiated at the right time? This being said, what have we really learnt relating to the conception and birth of this first Grand Lodge ? That the Craft was “neglected” by its “Master of Works”, incorrectly identified as its “Grand Master”, who was an architect of great repute and aged eighty-five in the year 1717. That the time was favourable as the kingdom was disentangled from foreign and civil Wars, and enjoying the good Fruits of Peace and Liberty. Effectively there was a new Royal Family and the 1715 Jacobite Rebellion had been put down. We can also deduce from what we are told, that in the concerned period membership was in decline; that lodges weren’t recruiting either very actively and possibly some lodges were no longer meeting on a regular basis. In other word the survival of the Craft was at stake, at least in the London area. The initial project concerned a small nucleus of London lodges. There is no indication of a “national vocation” of the enterprise at the time. But from 1717 on Grand Masters are appointed yearly. Or was the title “formalised” after that date ? When was it decided to create a Grand Lodge ? Why deliberately choose to put at the head of the organization a member of the nobility ? How come that the appointment of the Duke of Montagu triggered such a keen interest in Freemasonry? Brother Vibert says that the effect of his becoming Grand Master, a fact advertised in the daily press of the period, was that the Craft leapt into popularity, its numbers increased, and new lodges were rapidly constituted. Furthermore why did learned members of the Royal Society for instance, and noblemen seek admittance into the Craft ? Did it all of a sudden become fashionable or trendy to become member of a “commoner’s club “, put on an apron and fiddle with tools ? As said at the beginning of this paper, I’m inclined to think that the birth of Grand Lodge was an “induced” one. The craft seemed to be in dire straits, its decline visible. So a project to inject some force and vigour into the old institution can only be seen as a laudable and honourable one. The problem is that its development went, at least according to my opinion, well over its initiators expectations and hopes, and that, in a record time. Was the Craft perceived as a sort of empty shell that could be picked up and used for a specific design ? A design, once adopted, that would divert it from its original purpose and turn it into a purely speculative society forever. But it would be one that would contribute to the stability and wellbeing of the kingdom as a whole. If this hypothetical thesis is true, was the Grand Lodge team conscious of it and just “surfed” the wave ? Or were they accomplices of its instigators ? My objective hereafter is to present how things could have happened in an attempt to prove that the Hanoverians took advantage of the new masonic movement and/or manipulated its new leaders, to use in to their ends. Let’s start by looking at the main political events that occurred in Britain in the years preceding 1717. The Stuart King James II was deposed in 1688 for being a Catholic, a “papist” as was said in those days. His position was effectively uncomfortable: his Scottish subjects are mainly Presbyterians, his English and Welsh ones are Anglican or Dissenters, i.e. Protestants who disagree with given elements of the Church of England. So England homes Methodists, Puritans, Baptists, Anabaptists, Quakers and so on. The King’s main supporters could theoretically be found in Ireland where Catholics were numerous. His daughter and son-in-law succeed him on the throne: Mary II and William III (Mary will reign from 1689 till 1694 and William from 1689 till 1702). William III is Dutch and Protestant, a member of the House of Orange. He defeated his father-in-law’s troupes at the Battle of the Boyne in 1690 in Ireland. Feat that is still annually commemorated by the members of the Orange Order, a Protestant Fraternal organization created in 1795 described as a masonic style brotherhood. It’s during his reign, in 1701, that Parliament adopted the Act of Settlement that virtually bans a member of the Roman Catholic Church from sitting on the Throne of the Kingdom. James II second daughter, Anne I, inherits the throne in 1702. It’s under her reign that in 1707 the Act of Union unifies England and Scotland as a single sovereign state. She deceased in 1714 and was he last monarch of the Stuart Dynasty. The closest protestant relative to the British Royal family is a German, the Elector of Hanover: George Ludwig of Hanover. His mother, who foresaw his future, wisely naturalized him as a British Subject. He became George I and was the first of the Hanoverian Dynasty to reign over the United Kingdom. His coronation in London in 1714 was accompanied by rioting in over twenty towns throughout England. The Cabinet Government led by Prime Minister Sir Robert Walpole detained the actual power and governed the realm; at the same time the power of the king diminished setting a trend that became institutional. George I wasn’t too popular. He spent a fifth of his reign in Germany and was generally perceived as too German. He was far from being charismatic: awkward in public, he was at times ridiculed by his British subjects. His inability to fluently speak English made him choose to communicate in French with his ministers. The way he treated his wife has been qualified as scandalous. In addition, with the South Sea Bubble burst in 1720 he became extremely unpopular. The event that is important for our purpose is the rising of the standard in Scotland by James Stuart, the Old Pretender, in February 1715. James being a catholic was of course denied legal access to the throne. Despite the help of Spain and the fact that his was opposing a “legal alien”, the Jacobites Rebellion leaded by James didn’t last long. That’s what can be said of the political situation and the historical context. We must now cover an import area: that of Freemasonry and the Jacobites. Frank McLynn in “The Jacobites” states that they had a crucial influence in the development of Freemasonry and that at one stage witnesses went as far as to describe the Craft as a gigantic Jacobite plot. He continues saying that Jacobites such as the Duke of Wharton in Spain, Patrick Gordon and James Keith in Russia, George Hamilton in Switzerland and Lord Winton in Rome, constituted lodges. Andrew Michael Ramsay, well known for his speech, was the tutor of Charles Edward Stuart, the future Bonnie prince Charles of the 1745 rising. James II took refuge in France in 1688. The Irish Brigade followed in his steps; it was made up of six regiments: Clare, Dillon, Bulkley, Roth, Berwick and Lally Tollendal and Fiztjames cavalry. Within these regiments were military lodges according to many historians. Tombstones in Saint Germain-en-Laye in the outskirts of Paris testify to their presence in the area. In Paris, the first lodge to be opened was the “Louis d’Argent” in 1726 at the initiative of Jacobites. Among the active and prominent Jacobites were Charles Radcliffe, James Hector McLeane, and Dominique O’Herty. McLeane was even the Grand Master of the Grande Loge de France in 1731. I read that the Duke of Wharton, that we’ve already met, was also Master of the French lodges! It seems realistic to state that the Jacobite lodges throughout the Continent wove a network, lobbying people in power and collecting intelligence. These lodges had openly a political objective. What about the Brethren involved in “Operation Grande Lodge” ? We known John Desaguliers lectured king George at Hampton Court. That he also wasn’t ready to act as Deputy Grand Master to the Jacobite Duke of Wharton before the objections surrounding his Grace’s nomination were ironed out and the Government consent assured. The Duke of Montagu is obviously a Hanoverian supporter. He received honours and distinctions from King George such as becoming Knight of the Garter in 1719. He raised a cavalry regiment in 1745 to fight and crush the second Jacobite Rebellion. Could his nomination be due to his political siding ? James Anderson did dedicate his “Royal Genealogies”(in 1732 it’s true) to Frederick, Prince of Wales. As for the others actors we’ve met, we have no evidence at all of them being staunch Hanoverians. Given the situation and knowing the success the project will have, isn’t in logical that the members of the Grand Lodge of England must be loyal and obedient servants of his Majesty King George ? Francis 2nd Duke of Buccleuch (1695-1751), the grandson of the Duke of Monmouth who was an illegitimate son of Charles II. He occupied the position in 1723-1724. He was a fellow of the Royal Society. His interest in the Court of George I was sufficient for him to be invested as a Knight of the Thistle in 1725. Charles 2nd Duke of Richmond and Lennox (1701-1750) was Grand Master in 1724-1725. He is the one that followed his father in Freemasonry. He was a fellow of the Royal Society, a member of the Order of the Garter, of the Bath and the Privy Council. In 1734 he created a masonic pro-Hanoverian lodge in the Château d’Aubigny in the northwest of France. In 1735 he created another lodge in an “Hôtel Particulier”, Rue Bussy in Paris, in collaboration with John Desaguliers. This was certainly part of a Hanoverian offensive plan to counterbalance the implantation of Jacobite lodges on the Continent. James Hamilton, 7th Earl of Abercorn (1686-1744) who headed Grand Lodge in 1725-1726. He was of Scottish and Irish nationality. He was also a Fellow of the Royal Society. William O’Brien, 4th Earl of Inchiquin (1700-1777) who held the position in 1726-1727. He was a Whig Member of Parliament for Windsor from 1722 till 1727. All these gentlemen were manifestly Hanoverian supporters who would want to back the new regime. It’s difficult to prove that the Grand Lodge became an instrument in the hands of the newly landed dynasty, a weapon to fight the well-established and politicised Jacobite Freemasonry. I of course have found no concrete document to firmly base this argument. If I didn’t stumble on even the beginning of a reliable hint to start from, I did come across one or two rather vague insinuations. So, and I agree it doesn’t meet historical criteria, we can only go by “feeling” and come to possible or probable conclusions built on a spectrum of information from various sources. We shall never cross into the” land of certitude”. But we can take into consideration a fair number of realistic presumptions that converge, to finally form an accumulation of logical, if not solidly proven, evidence to support our case. First we have a foreign King that crosses the Channel to take over a throne he knows to be contested by the elder branch of the former Royals. He is related to this family and is legally entitled to become King of the country according to an Act of its Parliament. His arrival is followed by riots throughout the country. He’s not at ease with his subjects or their language. The least that can be said is that his situation is not really enviable and that from “day one” he is confronted by hostility and has to face serious issues. The main threat comes from his Jacobite relatives who have partisans in England but also in Ireland, Scotland and in many European countries. They have a network of spies and “agents provocateurs” operating through masonic lodges spread out in many countries that give their movement an international dimension and audience. The Stuarts have strong and historical ties to Freemasonry. Stuart King Charles II played an important part in the development of the Royal Society that housed many learned men eager to access to the “mysteries of Science and Nature”. Two main European kingdoms are friendly to their cause: France and Spain, both catholic dominated states. So the struggle had a religious aspect as well. Both the Old and Young Pretender took refuge in Rome and benefit from the Vatican’s assistance for many years. So it is vital for King George to seek help and assistance from all horizons, from wherever and whomever it may come. The Duke of Wharton’s case illustrates what he may have had to do on given occasions to “establish in strength” his dynasty. It seems he gave out titles and positions to “persons of interest” to build up a power group around his throne. He needed to “recruit” partisans of his own if he wanted to last. Then a group of masons appear on the stage. When these Freemasons of London were looking into consolidating their institution and updating its structures, they probably sought approval and support from those “above”, those who detained the power. 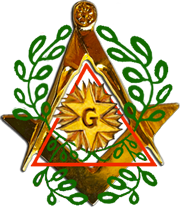 Is it not possible that “Operation Grand Lodge” took shape then with the idea of involving learned men, “bourgeois” of the City and noblemen in the project ? A nobleman at its head would assure the respectability of the institution. It would also attract new members: some social climbers obviously whose ego would be flattered to mix with the higher classes, but also men of good repute, defenders of the newly established order, men seeking peace after an era of religious conflicts and those wanting to build a fruitful future for the kingdom. Doesn’t the new form of Freemasonry, as designed in the newly revised Constitutions, fit perfectly into the picture ? An institution that bans the eternal dividing topics: politics and religion. An institution that would allow men of different religious confessions and political opinions to socialize and hopefully fraternize. A place where ideas could circulate and where differences could be flattened. More pragmatically encourage a Hanoverian version of Masonry that could spread out in Britain, then in European countries, and end up by annihilating the competing Jacobite version. It would also contribute to pacify the Kingdom. Bring cohesion amongst the Kings subject. It would result in securing the future of the new British Royals. Isn’t it what King George I wanted to achieve ? So what about Masonry being On His Majesty’s Service ? Simon J. Appleton, Nouméa, October 5th 2014. “Des Loges Jacobites” (21 pages – 1992). “Nos ancêtres, les Ecossois” (22 pages – 1993).